Not too early to plan some early-spring bass fishing. The top early bird lakes for bass that can have rapidly warming water temperatures are Alamo, Havasu, and Martinez. At Havasu this time of the year, there tends to be some short-lived, pre-spawn activity. But it is early. 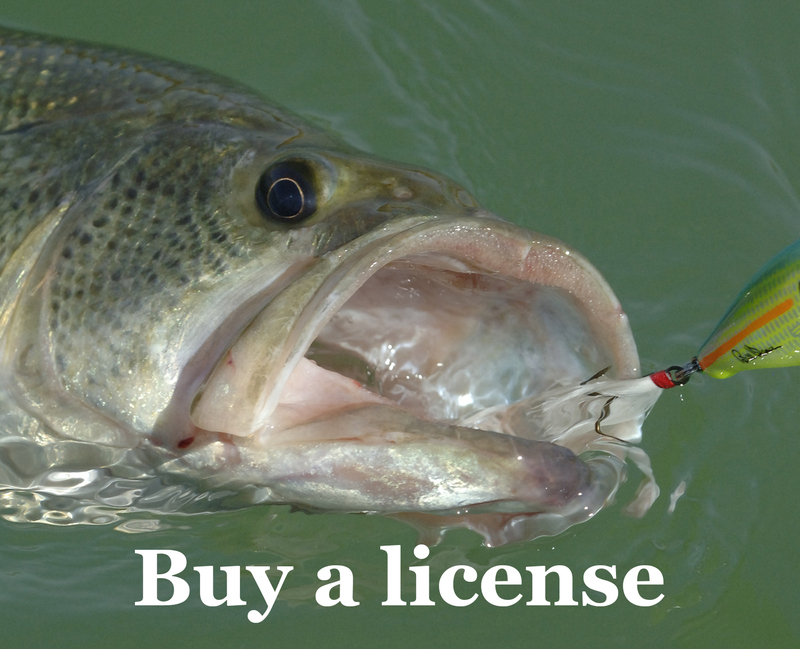 Most bass remain deep (15-30 feet in general at desert impoundments) and are lethargic. At least at the western impoudments, anglers can expect water temperatures to be a couple degrees higher than at other of our state’s desert lakes. Look for a long stretch of calm, sunny weather to usher in some better bass action. Water temperatures at most desert impoundments are in the low-50s. So trout remains a great option. We’re stocking our “core” Community waters this week. Does river trout fishing in the desert sound like a plan? Whether you’re a winter visitor or want to explore central Arizona, the Lower Salt River is an excellent option. Plus, it’s being stocked this week. 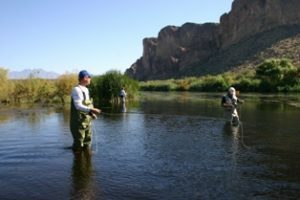 Anglers get the unique experience of stream fishing for trout in the desert. The Lower Salt, just minutes from some of the Valley of the Sun’s population centers, is stocked with trout throughout the winter and offers good shoreline fishing options as well. A Tonto Pass is required. Try nightcrawlers, small spinners, Kastmasters and flies. You might be able to catch some bass or sunfish in the deeper holes. 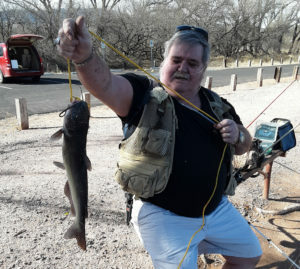 This angler hooked into this nice channel catfish fish at Dead Horse Lakes in Cottonwood on Saturday, Jan. 19 using a nightcrawler for bait. The fish reportedly was caught in the middle lake during the middle of the day. Rainbow trout: “Core” Community waters, Lower Salt River, Fain Lake, Saguaro Lake. Family Fishing Day, 8 a.m.-noon, at Red Mountain Lake, 7745 E. Brown Rd, Mesa.